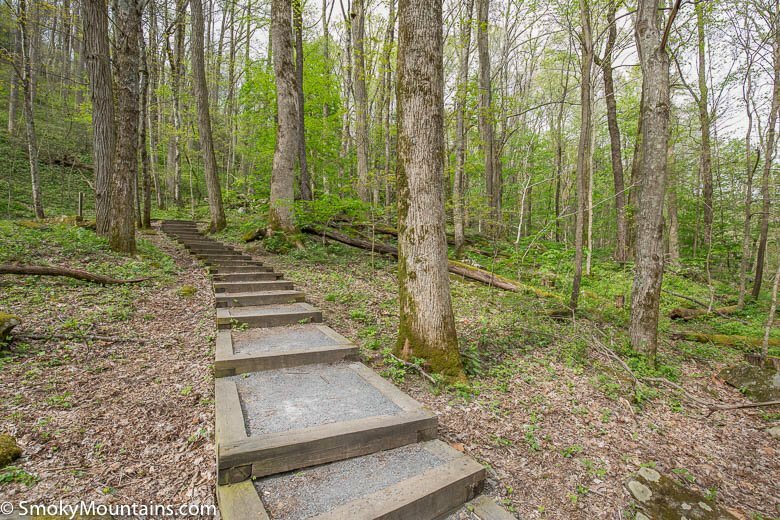 This self-guided nature trail is well worth sparing an hour or two for. 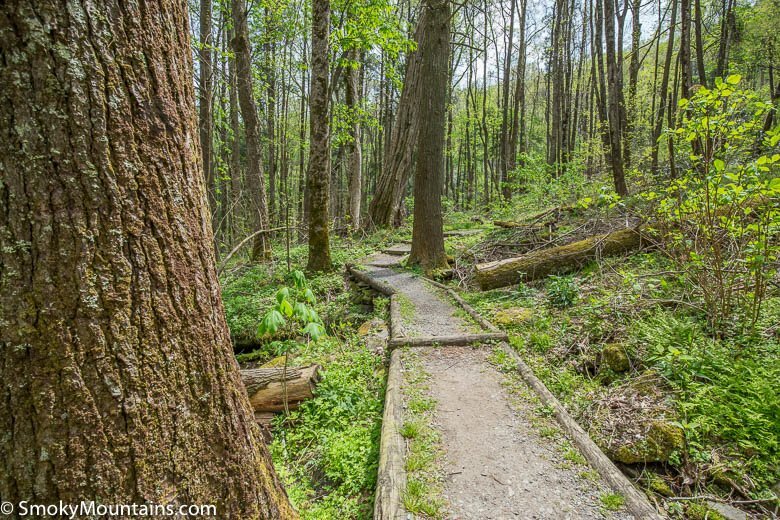 Its wildflower gardens and old-growth trees—two natural features the Great Smoky Mountains are especially famous for—are some of the easiest to reach in the national park. 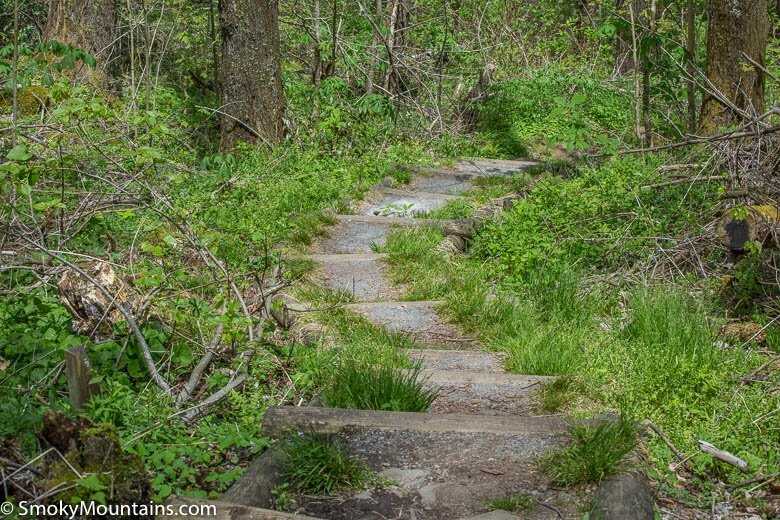 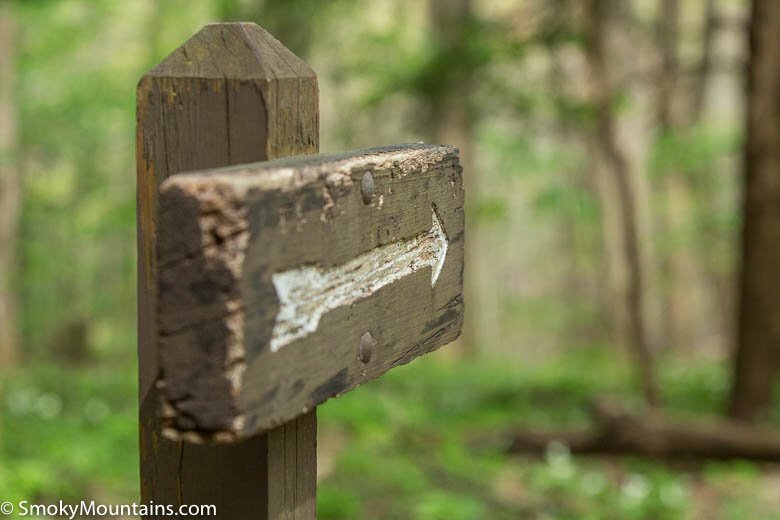 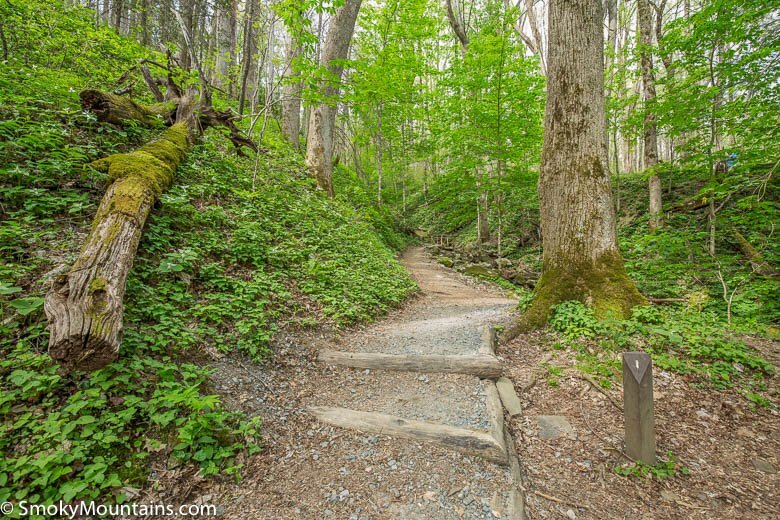 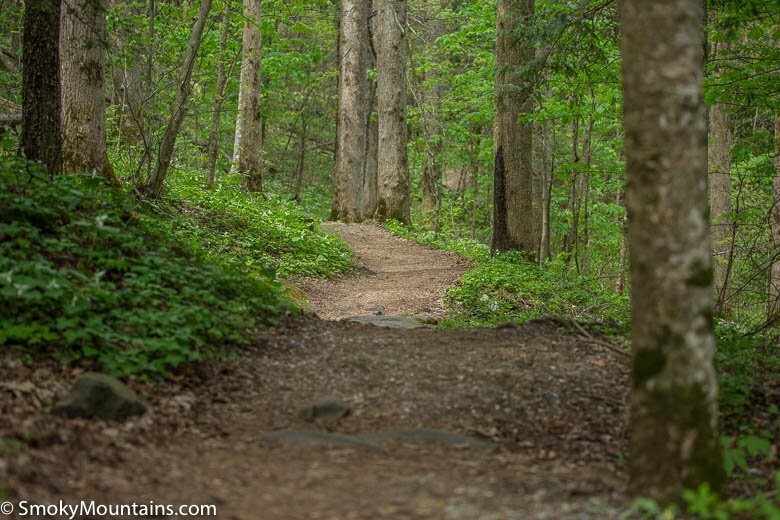 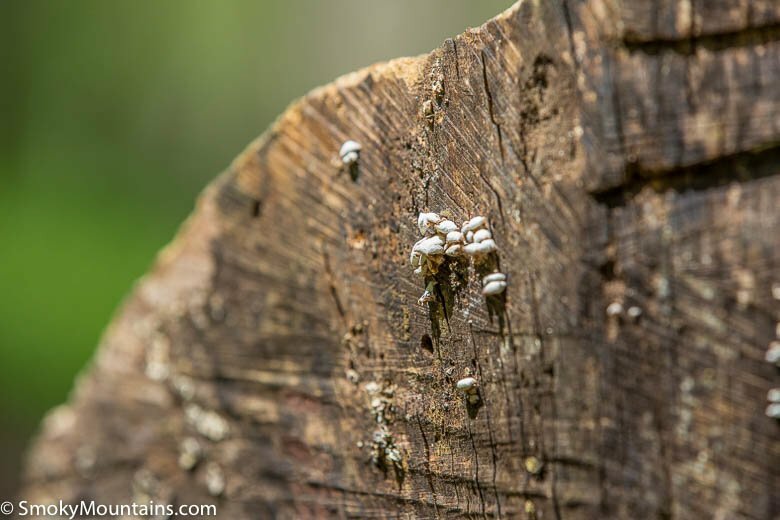 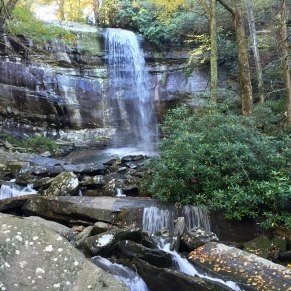 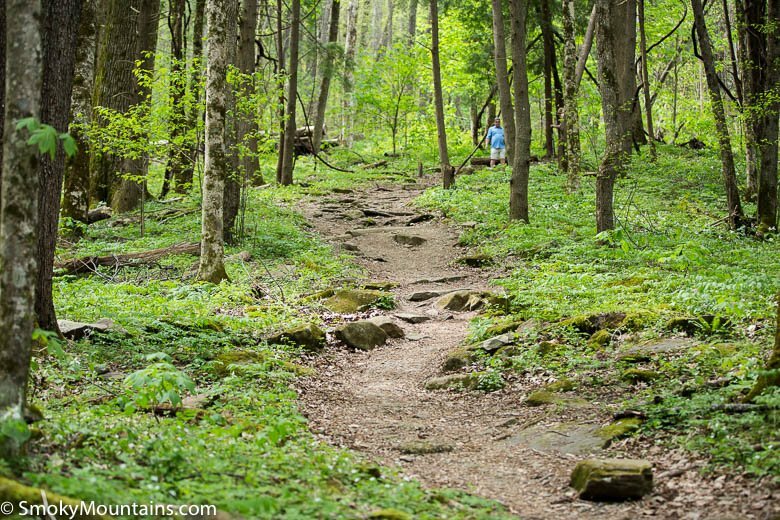 Short but very sweet, the Cove Hardwoods Nature Trail is a self-guided interpretive footpath that serves as the perfect introduction to one of North America’s richest ecosystems: the Southern Appalachian cove hardwood forest. 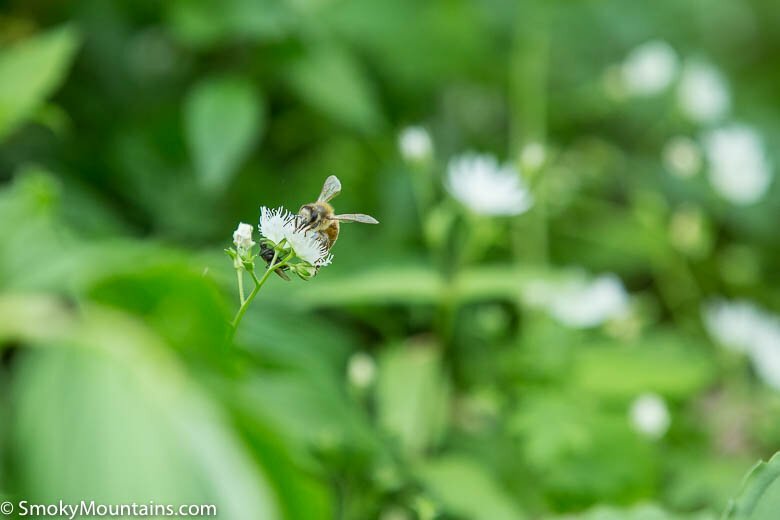 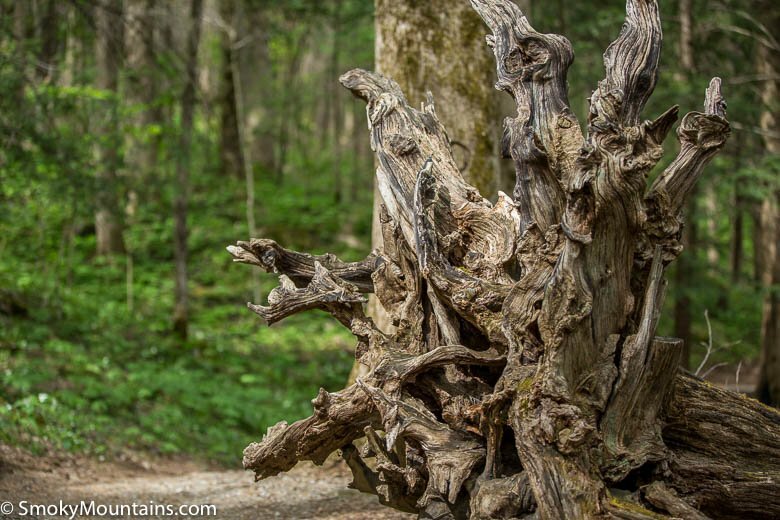 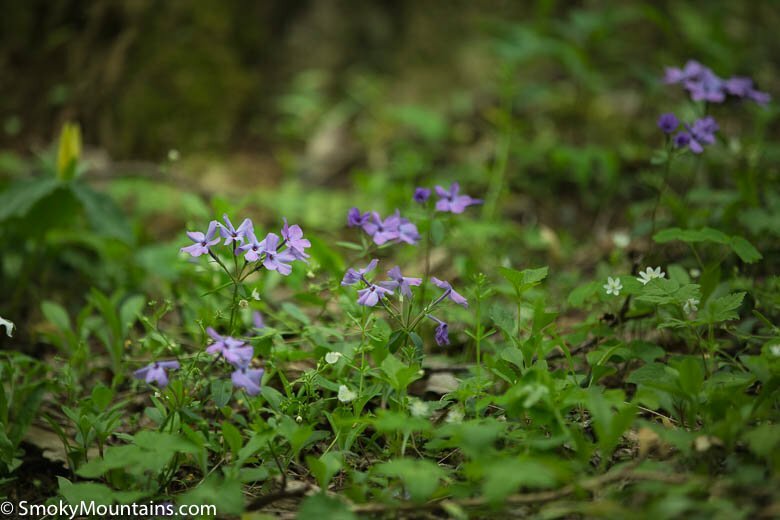 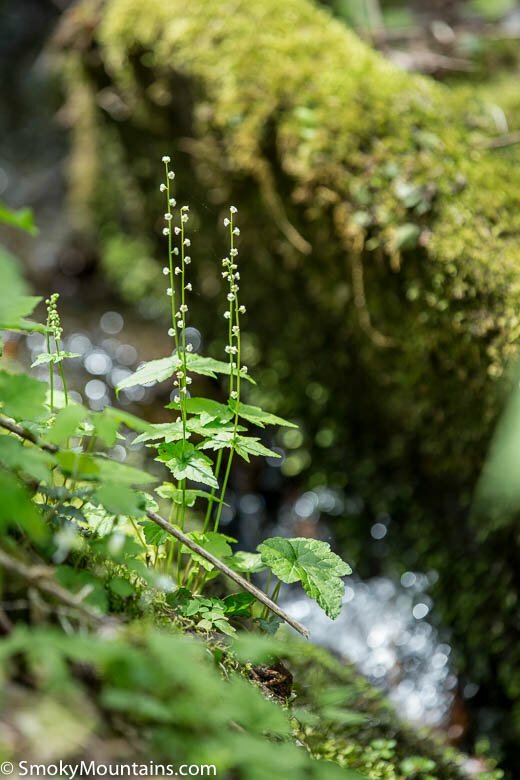 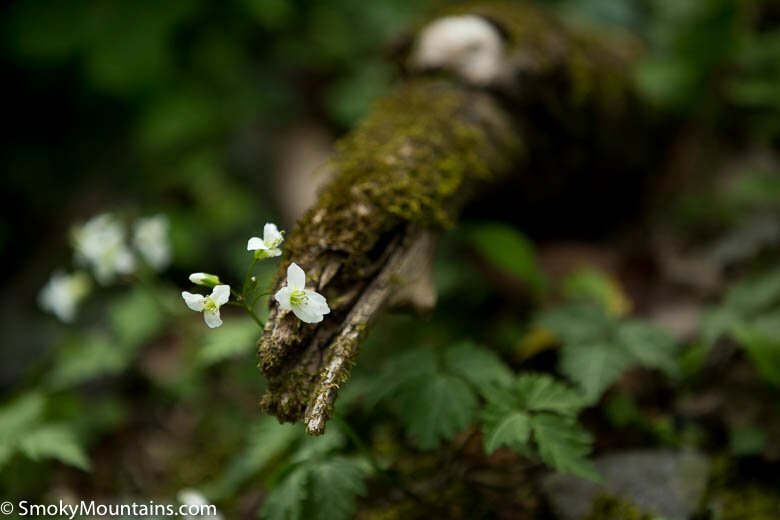 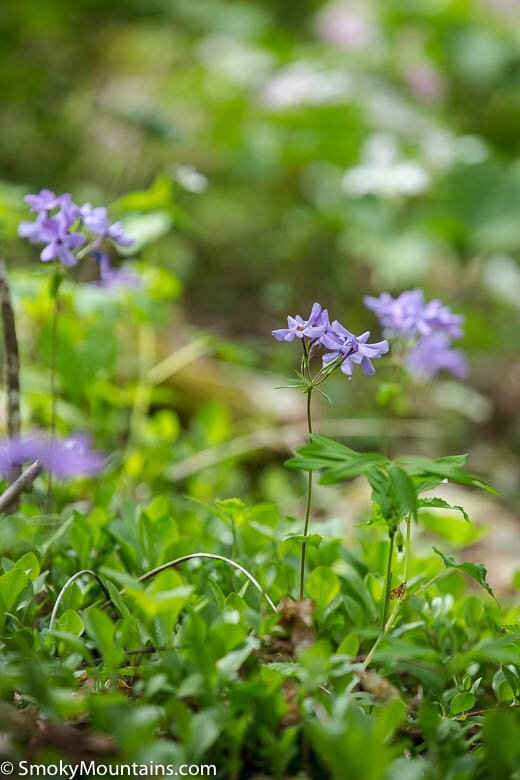 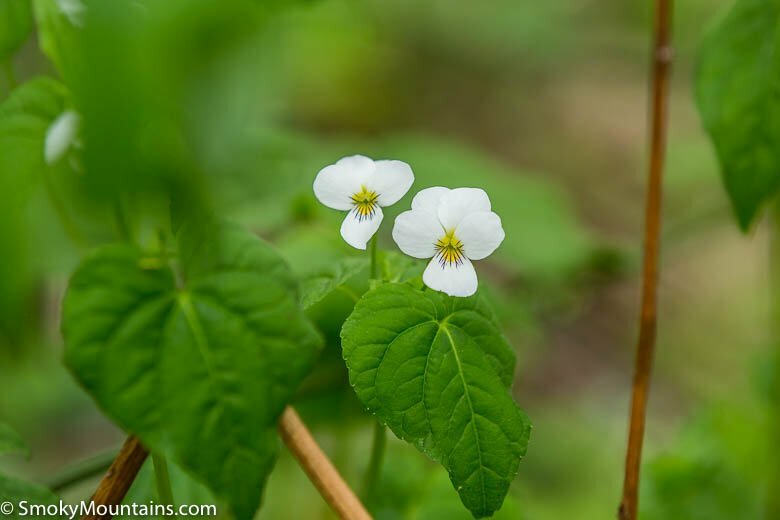 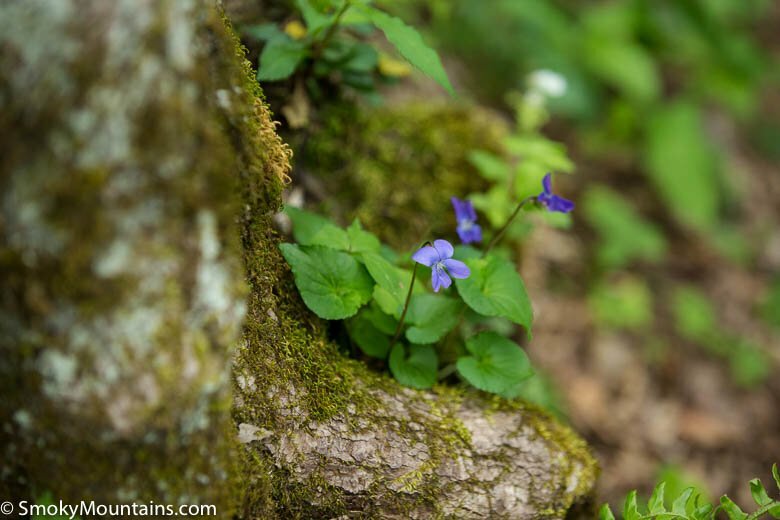 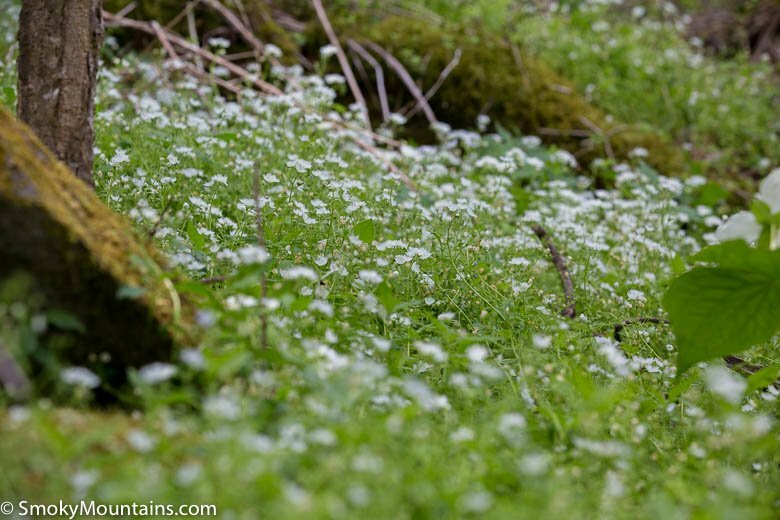 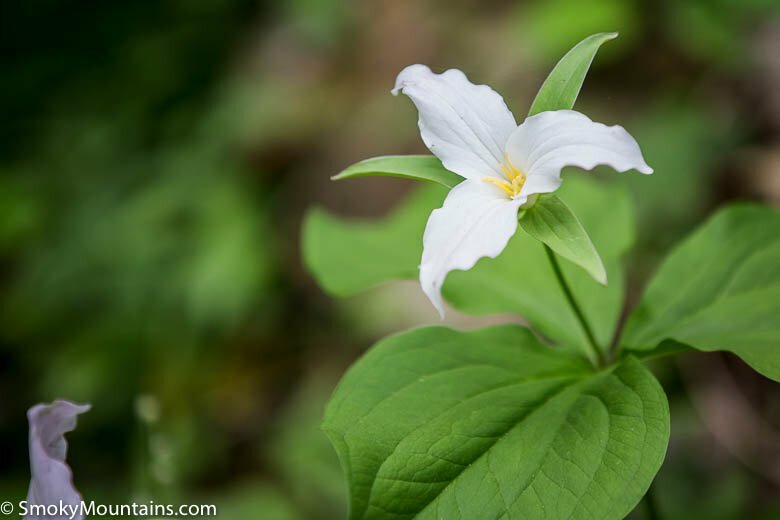 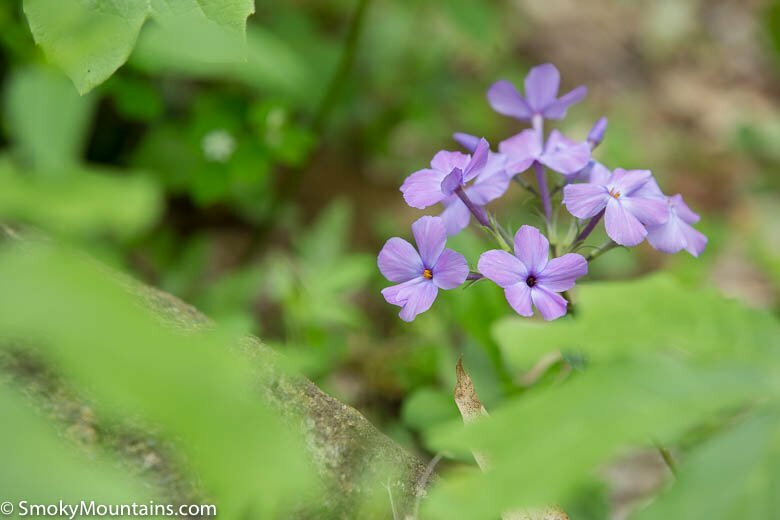 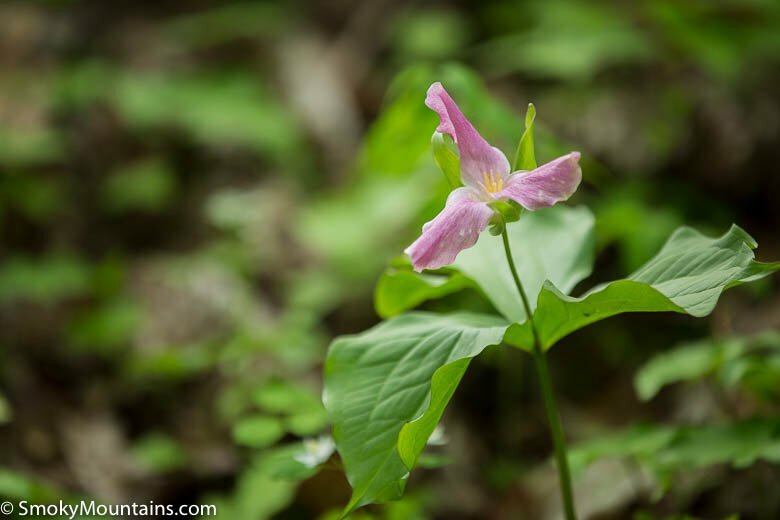 In spring, the woods here serve up a truly spectacular wildflower display: one of the most lavish and accessible in Great Smoky Mountains National Park. 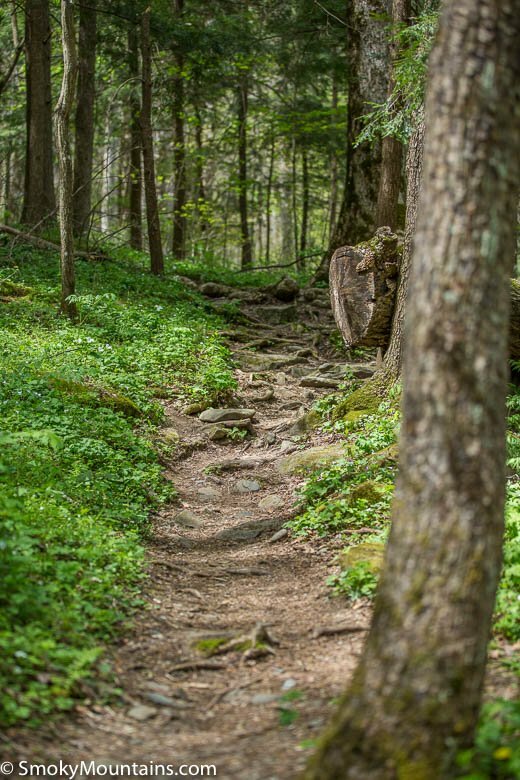 A loop hike, the nature trail is a mere nine-tenths of a mile in length, but claims its share of ups-and-downs and stream crossings. 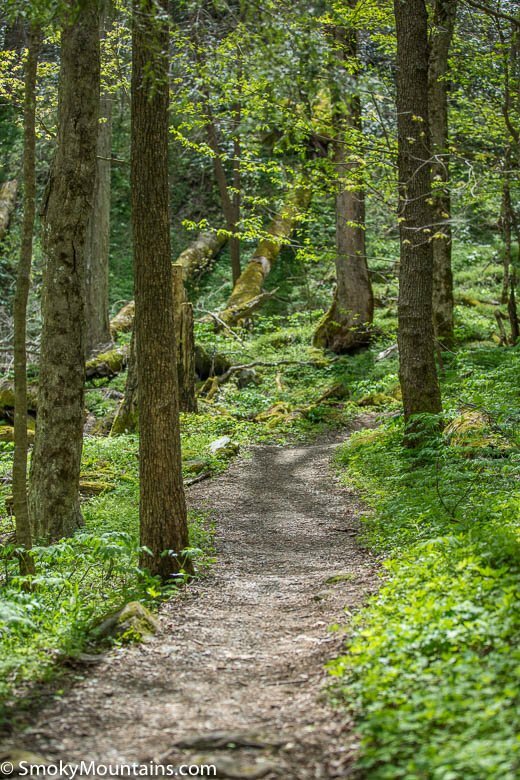 Give yourself an hour at least to fully appreciate the entrancing forest here. 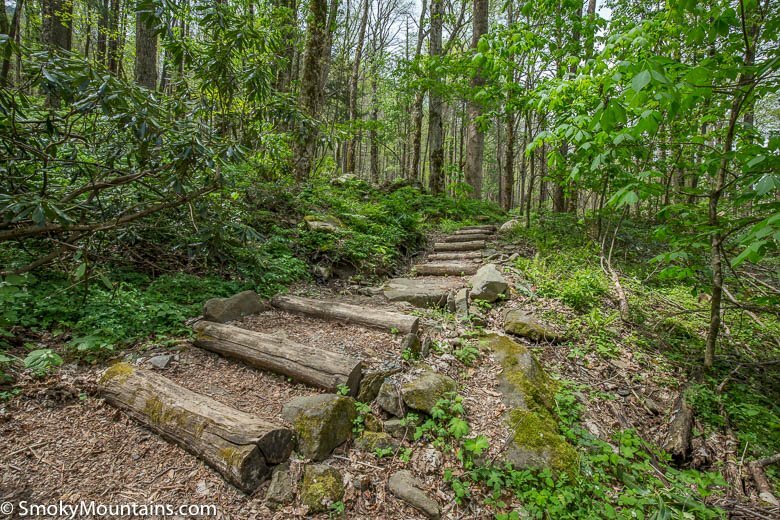 If you’re a photographer visiting during the peak spring bloom, you could easily spend several hours here composing top-caliber shots. 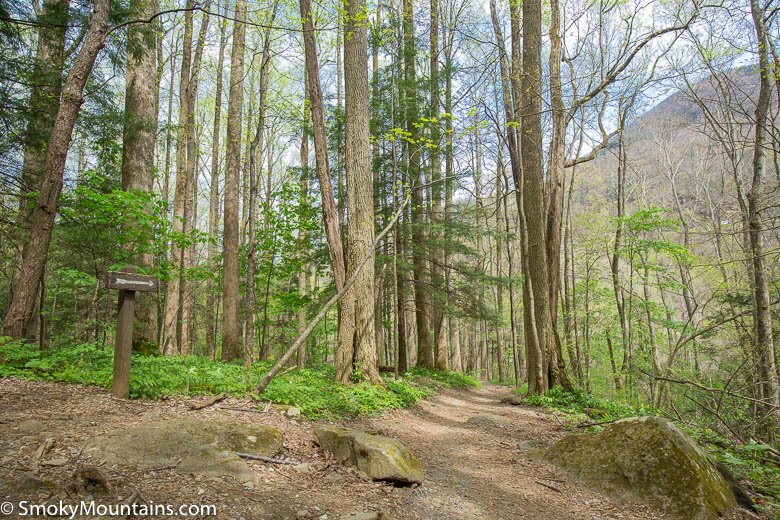 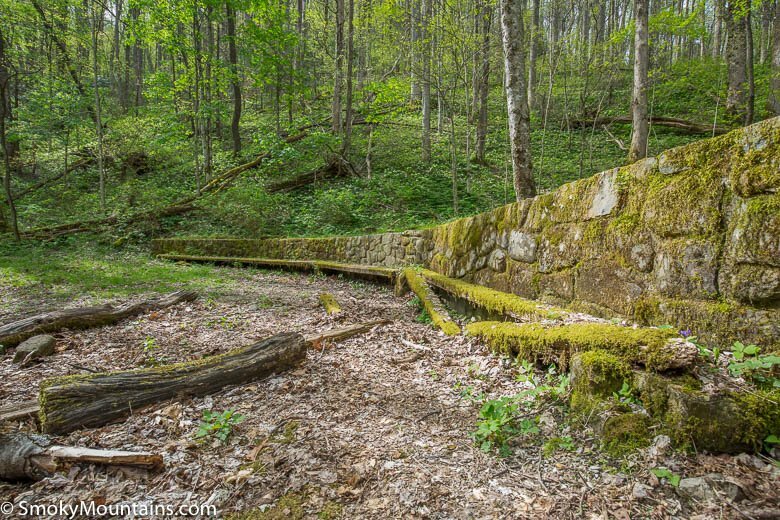 The Cove Hardwoods Nature Trail starts in the Chimney Tops Picnic Area off Newfound Gap Road. 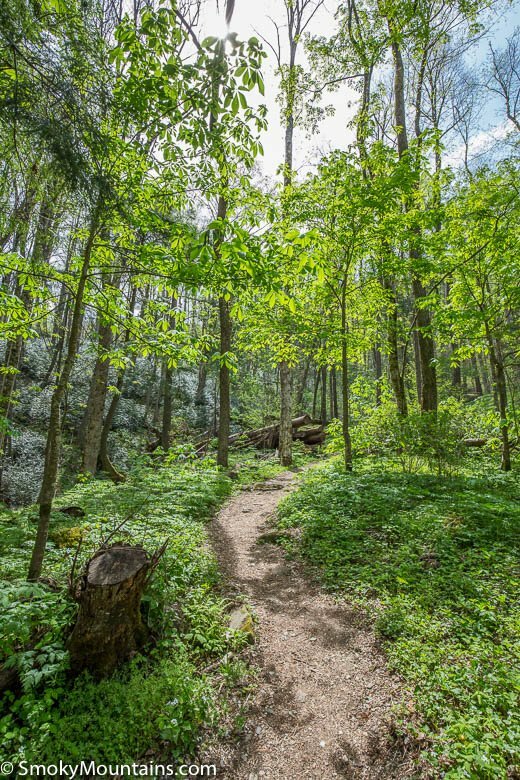 The cove hardwood forest in question grows in a hollow tucked into Sugarland Mountain’s northern footslopes, above the West Prong of the Little Pigeon River. 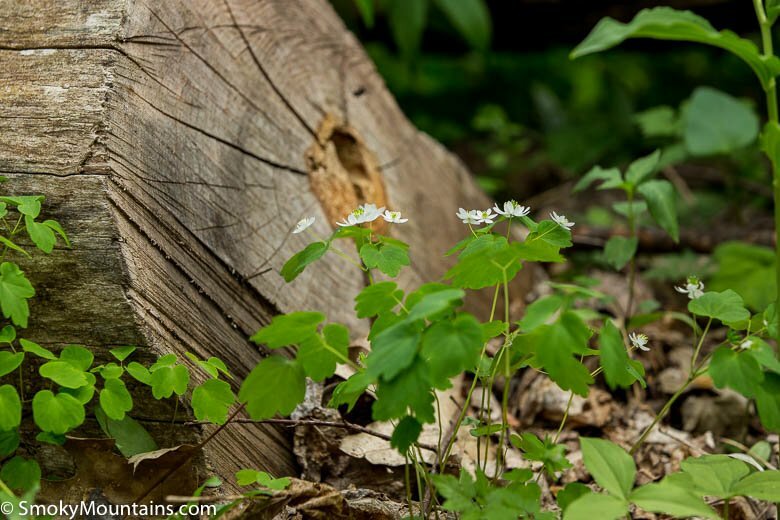 Cove hardwood forests occupy lush low- to mid-elevation ravines and basins. 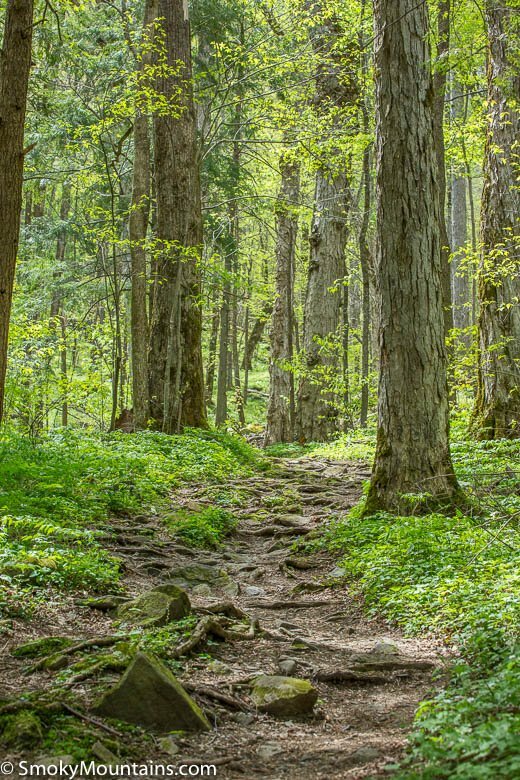 Here, eastern hemlocks join an astonishing array of broadleaf trees—basswood, Carolina silverbell, yellow birch, cucumber magnolia, red and sugar maple, yellow buckeye, tulip-tree, dogwood, and others—to form a marvelously diverse overstory. 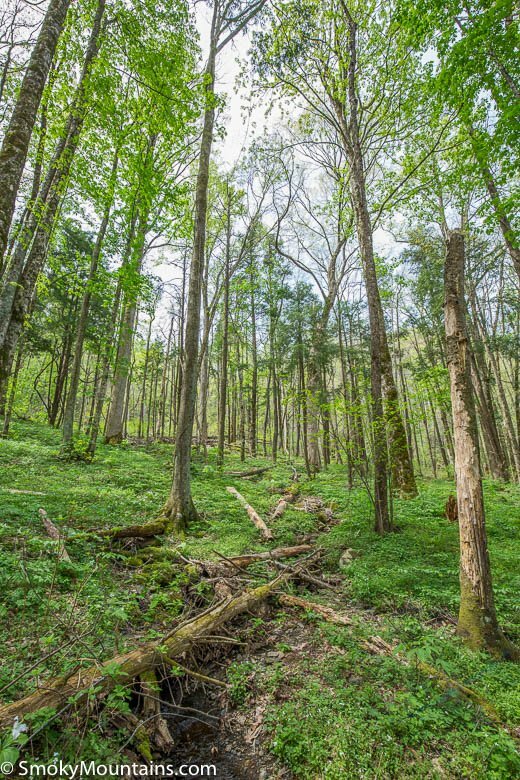 Before the infamous blight decimated them, American chestnut—one of the very biggest hardwoods in North America—towered over these moist groves. 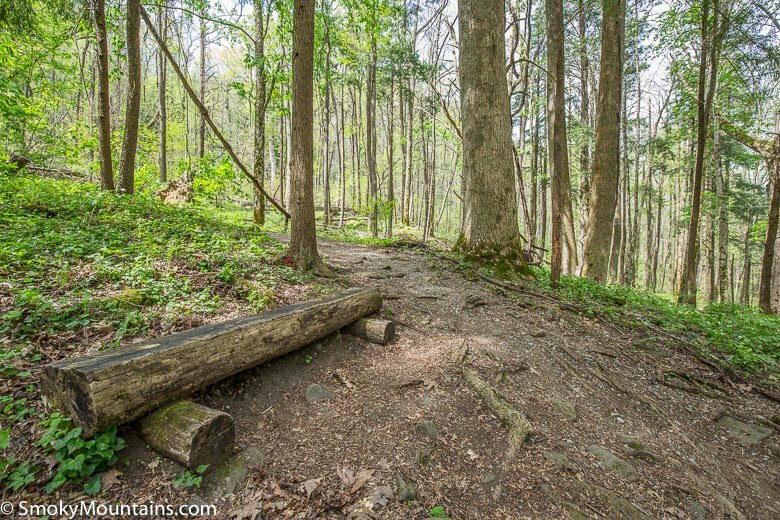 Although part of this hollow was logged, a good portion of the forest along the Cove Hardwoods Nature Trail is old-growth, which gives you a sense for the stature cove-hardwood trees can attain. 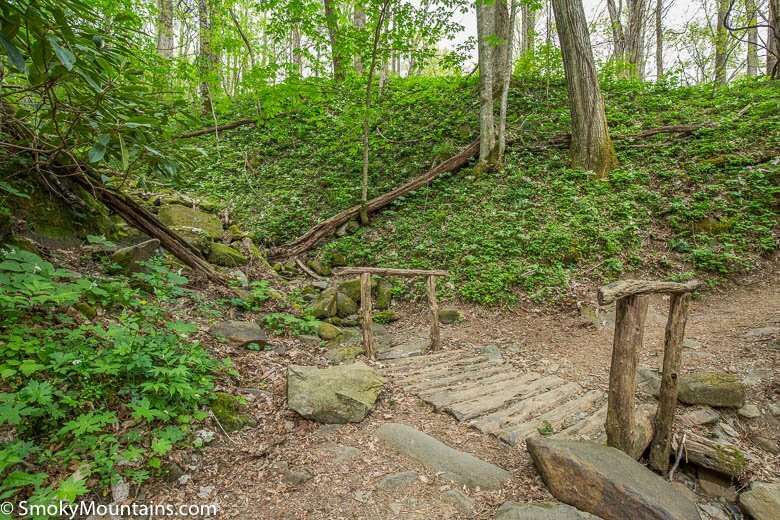 There are some mighty specimens here, including ancient yellow buckeyes and sugar maples. 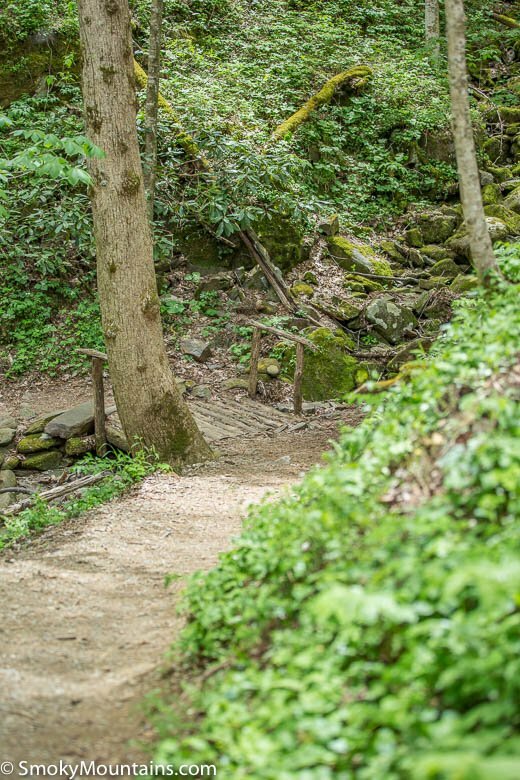 To get the most out of your ramble on the Cove Hardwoods Nature Trail, pick up the interpretive brochure at the trailhead: You’ll find numbered stops along the path directing you to ecological insights in the guide. 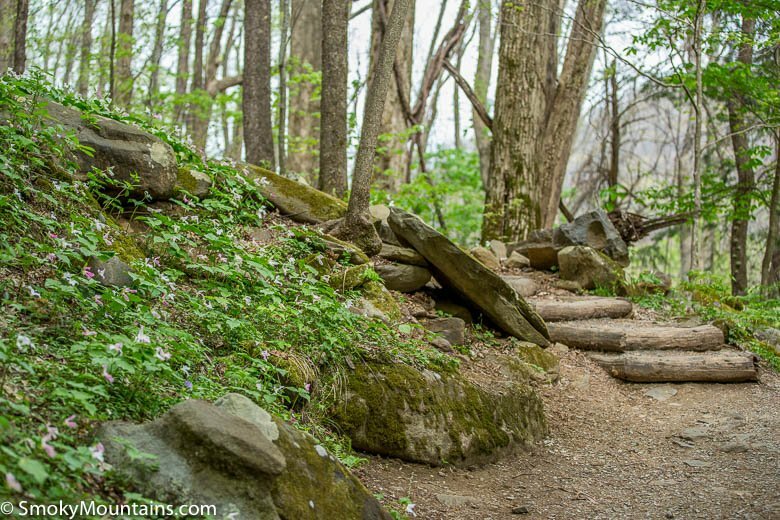 The loop hike is lovely any time of year, but there’s no question the most show-stopping season is spring. 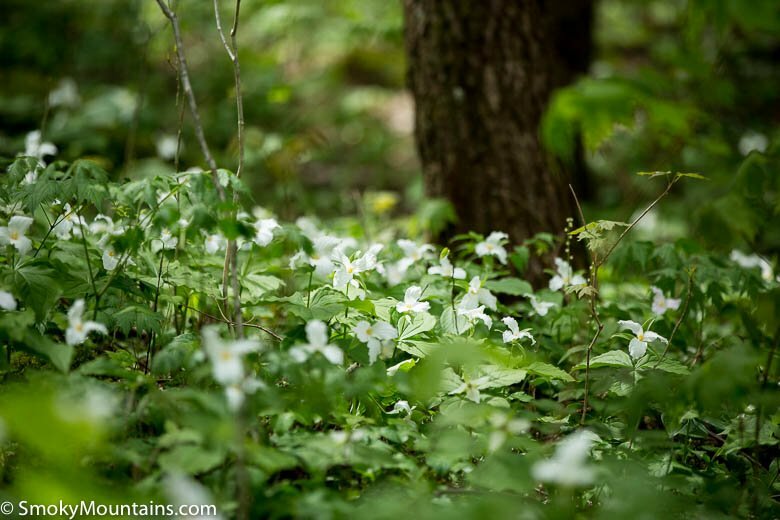 From April through early May, the forest floor here completely erupts in blossoms. 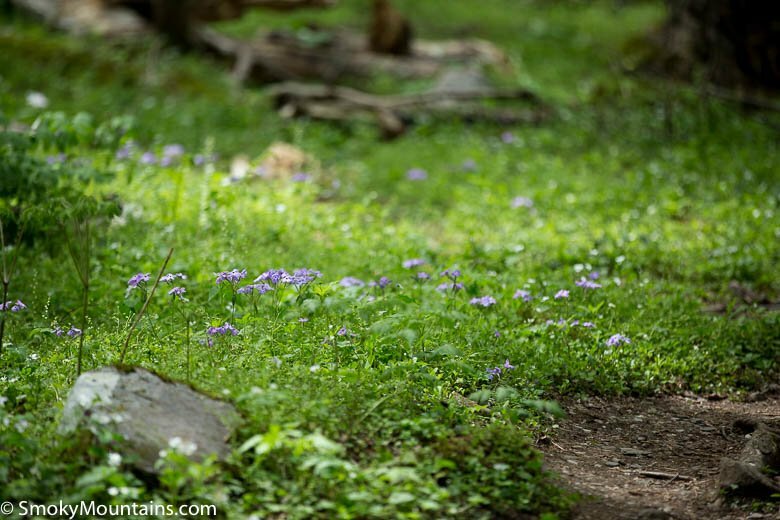 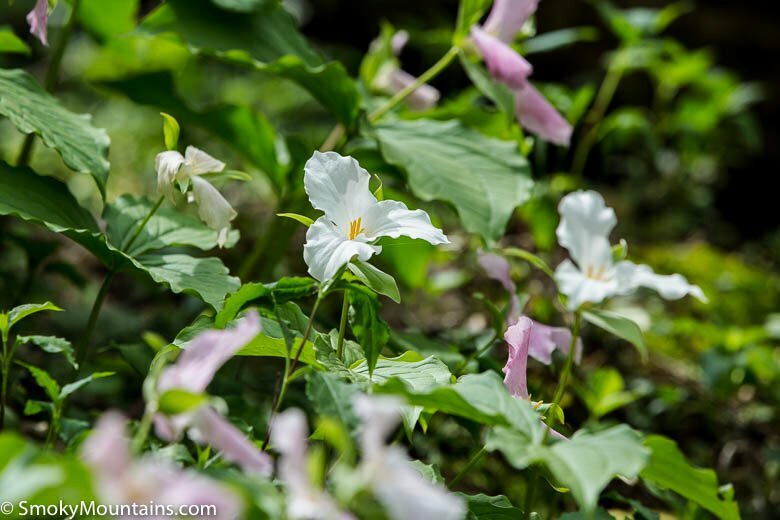 Dozens of wildflowers bloom along the trail, including great beds of fringed phacelia and trilliums. 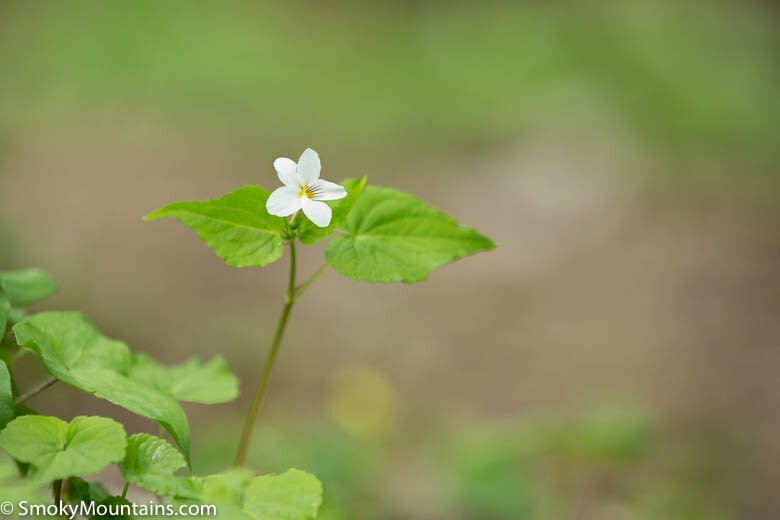 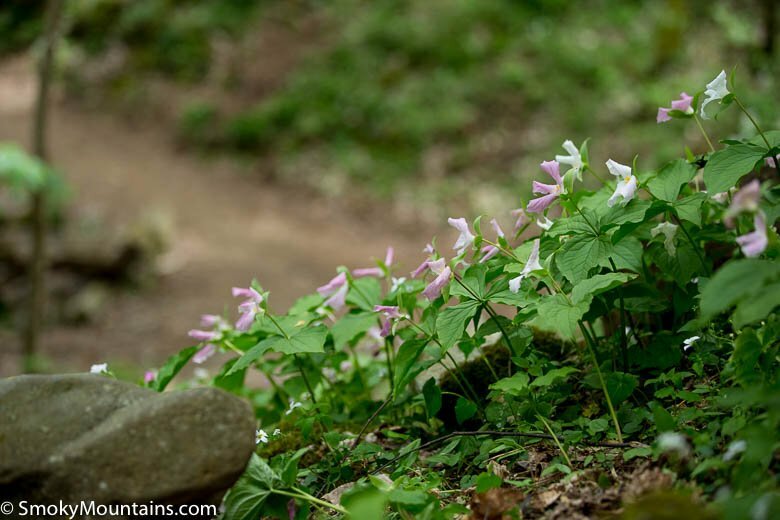 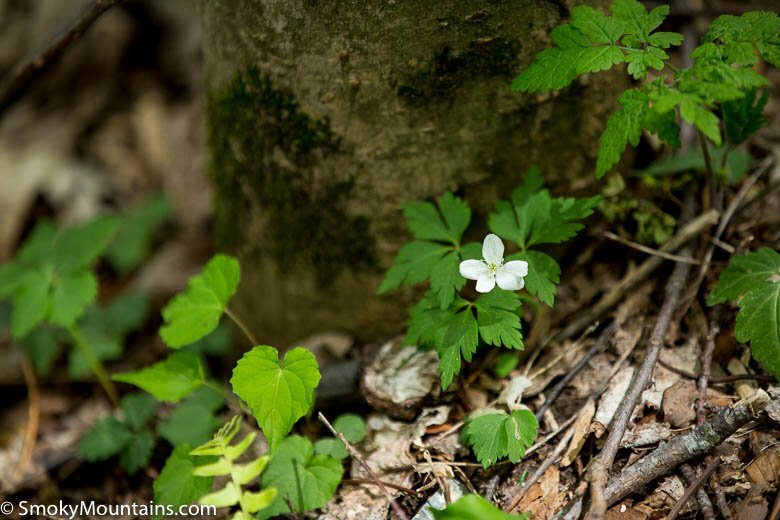 Other species include spring beauty, squirrel corn (a kind of bleeding-heart), toothwort, rue anemone, and violets. 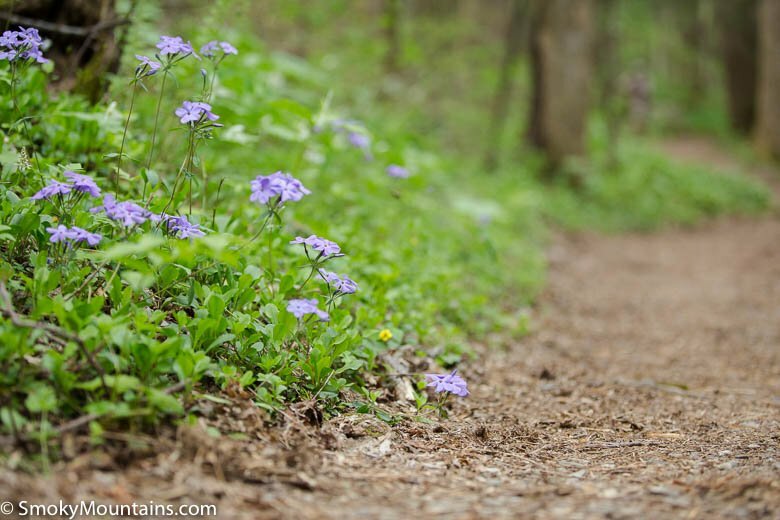 -The spring wildflowers get most of the attention, but the Cove Hardwoods Nature Trail is also pretty darn spellbinding in the autumn. 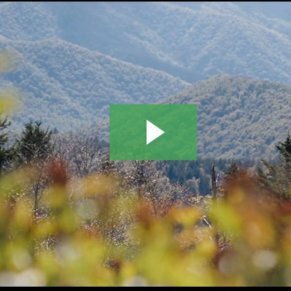 The wide range of broadleaf trees creates a multicolored fall canopy. 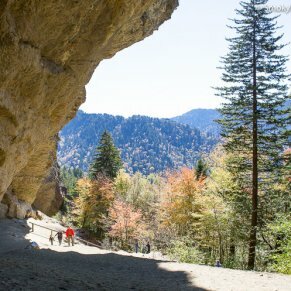 Take the main Parkway (Highway 441) out of Gatlinburg into the Great Smoky Mountains National Park. 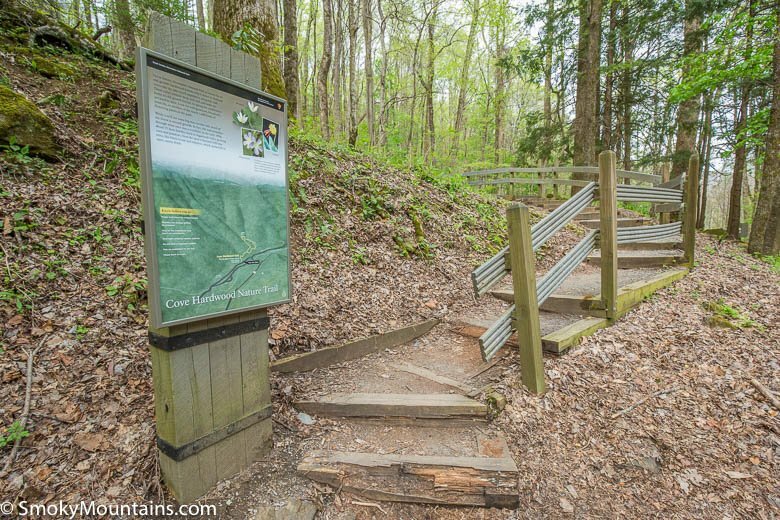 Continue past the Sugarlands Visitor Center (on your right) and take note of your mileage. 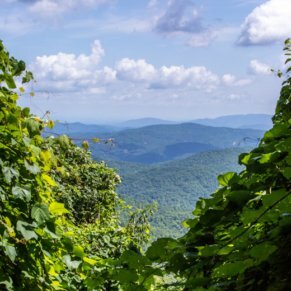 The Chimneys Picnic Area, where you will park, is approximately 4.4 miles past the visitor center on 441.